In a new study published in the journal Arthritis & Rheumatology, researchers discovered that osteoarthritis patients who undergo hip or knee replacement may increase their risk of short-term heart attack. The study authors note that about 1.8 million arthroplasty surgeries are performed every year, and the majority are hip and knee replacements. For the study, researchers analyzed 13,849 patients who were 50 years of age or older with knee osteoarthritis. Between January 2000 and December 2000, each participant underwent total knee replacement surgery. The group was compared with 13,849 control subjects who did not undergo surgery. The study also included 6,063 hip osteoarthritis patients who were 50 years of age or older and who had total hip replacement surgery during the same time period in 2000. The group was compared with 6,603 control subjects who did not have surgery. The research team found that heart attack risk significantly increased in knee replacement patients in the first month after surgery; in fact, 306 patients in the knee replacement surgery group had a heart attack during the average 4.2-year follow-up period. On the other hand, 286 patients had a heart attack in the control group. In the hip replacement surgery group, 128 people had a heart attack during the follow-up period. There were 138 controls who had heart attacks; however, the heart attack incidences were greater for the hip replacement patients in the first six months after surgery. The study also found that osteoarthritis patients may also increase their risk of long-term venous thromboembolism—a common lethal blood clotting disorder that includes pulmonary embolism and deep vein thrombosis. Osteoarthritis is the most common form of arthritis. In the U.S., the degenerative joint disease affects over 40 million people. It mainly affects the joints in the spine, knees, hips, hands, and toes. 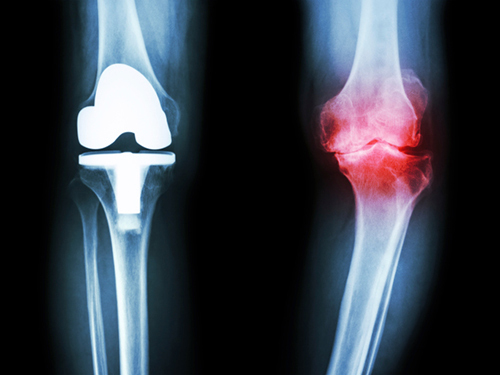 By age 85, symptomatic knee osteoarthritis affects approximately one in two people. Also, hip osteoarthritis will affect one in four people during their lifetime. Lu, N., et al., “Total Joint Arthroplasty and the Risk of Myocardial Infarction – A General Population, Propensity Score-Matched Cohort Study,” Arthritis & Rheumatology 2015, doi: 10.1002/art.39246. Whiteman, H., “Hip, knee replacement for osteoarthritis raises risk of heart attack,” Medical News Today web site, August 31, 2015; http://www.medicalnewstoday.com/articles/298756.php. “Arthritis: Arthritis-Related Statistics,” Centers for Disease Control and Prevention web site, last updated March 17, 2014; http://www.cdc.gov/arthritis/data_statistics/arthritis_related_stats.htm.